In my last post, I described how sketching an idea on a Lean Canvas is akin to stacking a chain of beliefs. Later links rely on earlier links, and cracks in your early links have a ripple effect. This is why it’s particularly important to confront your chain of belief and focus on your weakest links first — your riskiest assumptions. The real challenge isn’t idea generation, but idea validation. For an idea to be successful, it needs to constantly balance three types of risks: customer risk, market risk, and technical risk and I described the sweet spot of an idea being at the intersection of desirability, viability, and feasibility. But tackling all three risks at once can be overwhelming. How far do you go on each one and where do you start? 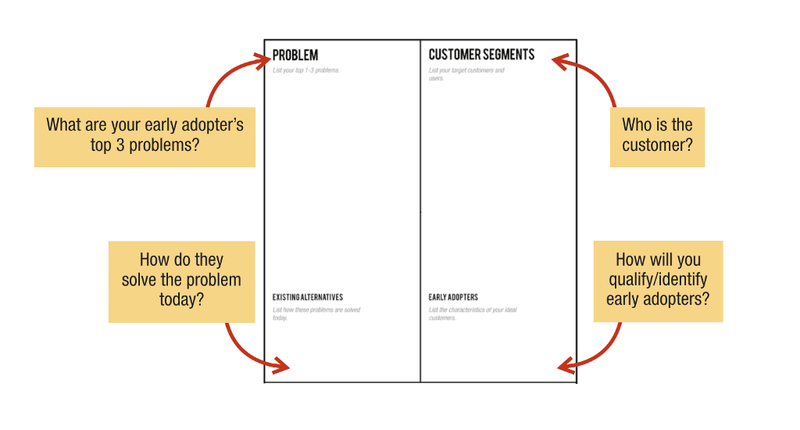 While sketching out a complete Lean Canvas is a great exercise for baselining an idea and internalizing the “business model as the product” mindset, at the earliest stages, however, it helps to more narrowly focus attention on just the two outer boxes of the canvas: Customer segment and Problem. The customer/problem quadrant are the outer pillars that hold up your business model. If you get these assumptions wrong, it’s easy to see how everything else in your business model falls apart. You end up describing a solution that no one wants (not desirable). Even if you manage to build this solution (feasible), no one buys it (not viable). Your channels and unfair advantages don’t offer any respite. Your business model is doomed. You can also use this customer/problem quadrant to test your desirability, viability, and feasibility risks. Grabbing your customer’s attention with a compelling unique value proposition (UVP) is the first battle. A good UVP is narrow (targets early adopters) and specific (nails a problem). If you can describe your customer’s problems better than they can, there is an automatic transfer of expertise — your customers start believing that you must also have the right solution for them. You’ve probably experienced this at your doctor’s office. After receiving a successful diagnosis, you probably believed your doctor had figured out your ailment, and you rushed to fill out their prescription — even though your doctor was simply following a systematic process of elimination by unpacking your symptoms (educated guessing). Marketer, Jay Abraham, calls this phenomenon the Strategy of Pre-eminence. Describing problems better than your customers grants you super-powers. The mistake a lot of innovators make is setting their pricing model relative to their solution. This is cost-based pricing and it’s sub-optimal. Customers don’t care what it costs to build your product, they want to buy a solution to their problems in order to achieve a desirable outcome. It follows then that pricing should be set relative to problems and outcomes — not your solution. The best initial evidence of viability or monetizable pain is a check being written. If your customers are currently spending money (or a proxy for money, like time) on solving a problem with an existing alternative, that’s often a good enough proxy signal for a problem worth solving at this stage. If on the other hand, you can’t list any existing alternatives, that’s a red flag. 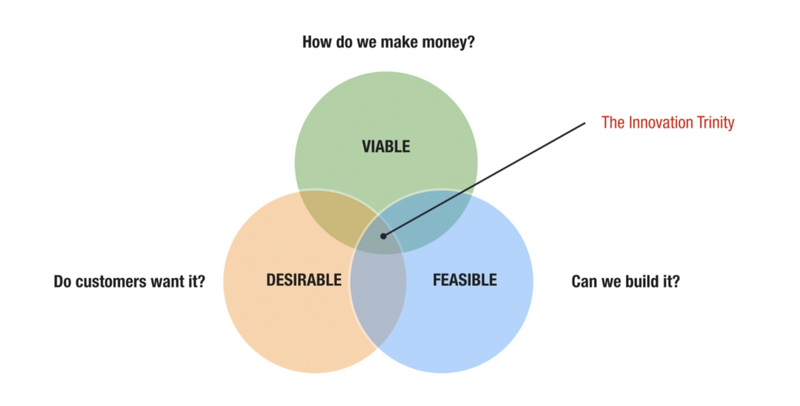 What about feasibility? Problems and solutions are two sides of the same coin. Most people start with a solution and then search for problems. But in a world where the biggest risk is building something nobody wants, it’s more effective to reverse this order. If your customer and problems assumptions are not yet grounded in empirical learning, it’s prudent to first get them in order. - What specific problems can I solve with my solution? But notice that there is no solution box in this quadrant. Like a prosecutor in court, you need to be able to make the case for the problems listed in this quadrant without relying on your solution. How do you that? By describing problems with respect to your customer’s existing alternatives instead. This is the essence of the Innovator’s Gift — my new project focused on finding better problem discovery techniques. Check it out here. In other words, don’t focus on problems you can solve with your solution. Rather focus on problems your customers encounter when using existing alternatives. Anchoring your unique value proposition, pricing, and solution against these problems is the secret to crafting an effective UVP that grabs attention and causes a switch — because it’s specific, familiar, and compelling. This subtle change in perspective is often the difference between inventing fake problems to justify your solution, and uncovering real problems worth solving. Download the Lean(er) Canvas PDF here. Make your case for problems without relying on your solution. 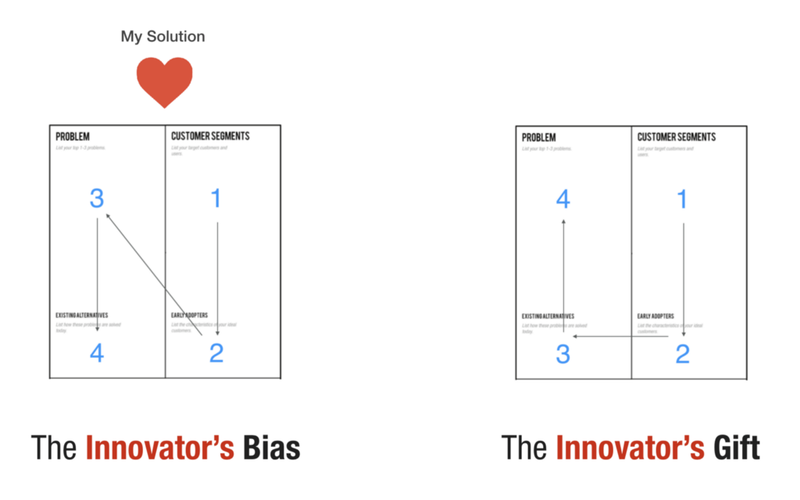 Reorder your Chain of Beliefs with a leaner Lean Canvas was originally published in Love the Problem on Medium, where people are continuing the conversation by highlighting and responding to this story.